Much of his known catalog of works contains images of the Bible. 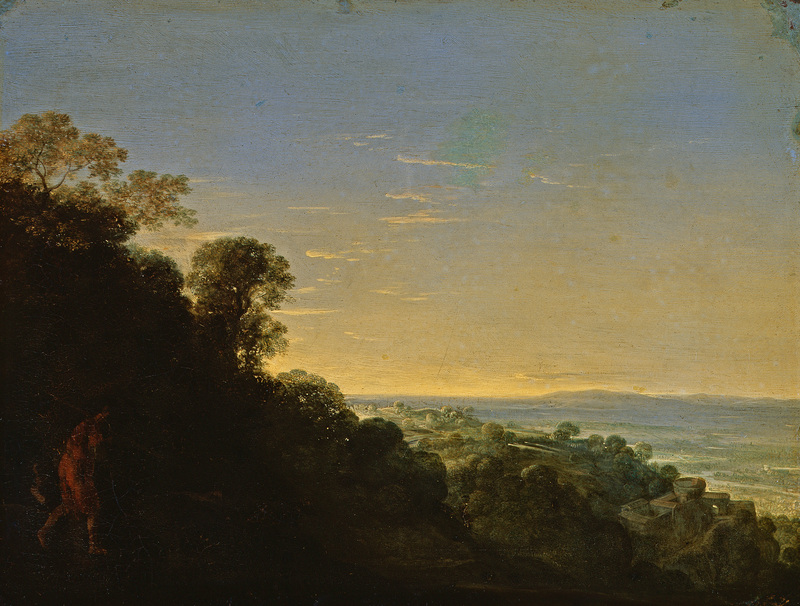 Oddly enough, it is perhaps the Greek goddess of the dawn that inspired Adam Elsheimer as he completed this painting. Aurora dates back to 1606 or 1607, only a few years before his death. It always amazes me that art endures for centuries. Even more so when the artist was barely able to survive and provide for his family. Elsheimer was living in Rome when he painted Aurora in oils on copper plate. My research hasn’t led me to discovering if the buildings in the valley are modeled after actual buildings. They may represent generalized “ruins” as were commonly used among painters during his time. To me, they look quite whole and are probably familiar to historians of that period. What attracts me to this work over the other paintings and drawings I’ve seen is the subtle glow of the breaking dawn. He refrained from adding directional beams of light from the glow. And, yet, somehow we see the light spreading across the landscape as the sun breaks above the horizon.